Your browser does not support the video tag. Ingredients Crust: 2 cups (500 ml) all-purpose flour 1/2 cup (125 ml) ground walnuts 1 cup (250 ml) Lactantia® Maple Flavoured Butter, cold, cubed 1 egg yolk 1/2 cup (125 ml) ice water Pinch of salt Filling: 1 cup (250 ml) golden syrup 1/2 cup (125 ml) Lactantia® Maple Flavoured Butter, softened 1/2 cup (125 ml) lightly packed brown sugar 2 large eggs, beaten 1-1/2 tsp (7 ml) white vinegar 1 tsp (5 ml) pure vanilla extract 1/2 cup (125 ml) toasted chopped walnuts (optional) Instructions Crust: In a large bowl, combine flour and ground walnuts. With pastry blender or 2 knives, cut into Lactantia® Maple flavoured butter until mixture resembles coarse breadcrumbs. In small bowl, whisk egg yolk and ice water and add pinch of salt. Add to flour mixture, stirring with a fork until pastry forms a ball (careful not to over mix). Shape dough into a small disk. Wrap in plastic and refrigerate for 1 hour or until firm but not hard. Preheat oven to 400°F (200°C). On lightly floured surface, roll out pastry to 1/4-inch (5 mm) thickness. Using 4-inch round or fluted cookie cutter, cut out 12 circles. Press each circle into muffin cups and refrigerate while preparing filling. Filling: In medium bowl, vigorously mix together, golden syrup, Lactantia® Maple flavoured butter, sugar, eggs, vinegar, vanilla and walnuts (if using). Spoon filling into pastry shells until two-thirds full. Bake for 15 to 18 minutes or until filling is puffed and pastry is golden. Tip: For runny butter tarts use the shorter cooking time. In a large bowl, combine flour and ground walnuts. 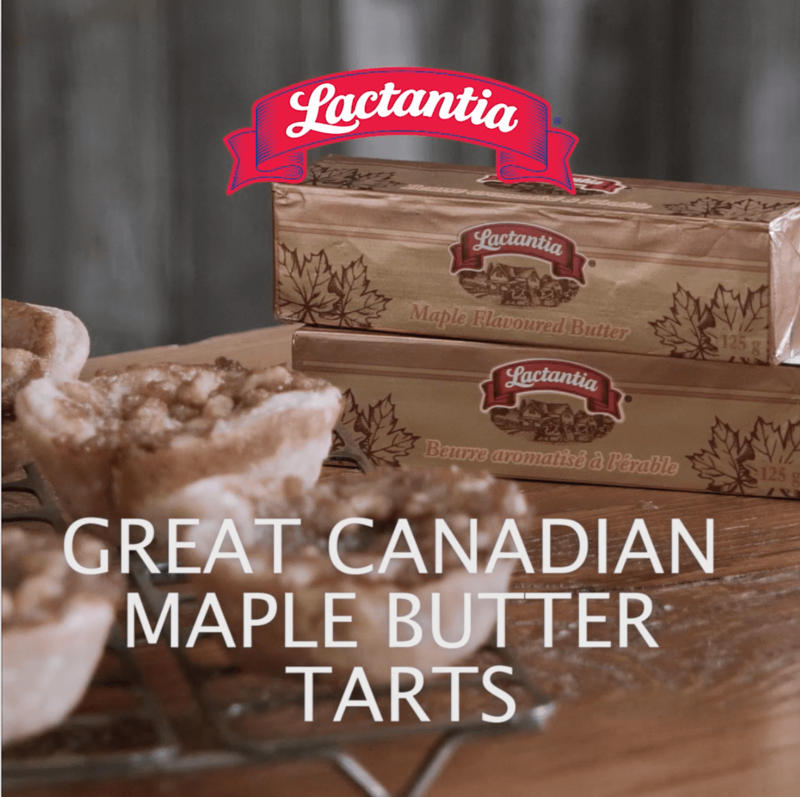 With pastry blender or 2 knives, cut into Lactantia® Maple flavoured butter until mixture resembles coarse breadcrumbs. In small bowl, whisk egg yolk and ice water and add pinch of salt. Add to flour mixture, stirring with a fork until pastry forms a ball (careful not to over mix). Shape dough into a small disk. Wrap in plastic and refrigerate for 1 hour or until firm but not hard. Preheat oven to 400°F (200°C). On lightly floured surface, roll out pastry to 1/4-inch (5 mm) thickness. Using 4-inch round or fluted cookie cutter, cut out 12 circles. Press each circle into muffin cups and refrigerate while preparing filling. In medium bowl, vigorously mix together, golden syrup, Lactantia® Maple flavoured butter, sugar, eggs, vinegar, vanilla and walnuts (if using). Spoon filling into pastry shells until two-thirds full. Bake for 15 to 18 minutes or until filling is puffed and pastry is golden.